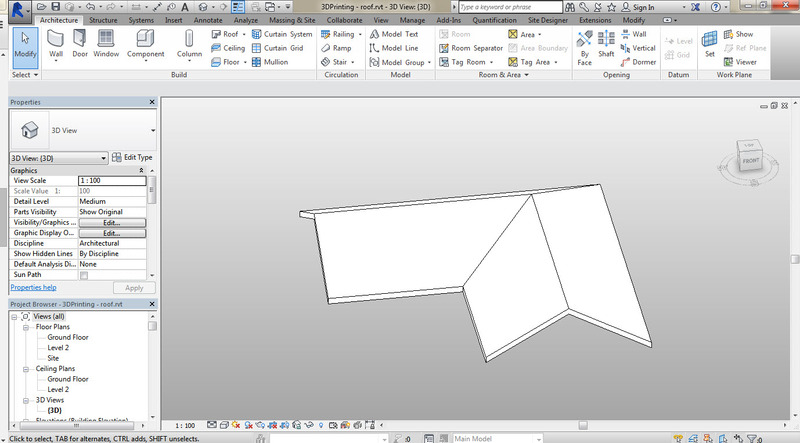 With this article/blog we are going to illustrate the process of 3d printing a Revit model. Initially you need to realise that in architecture we work with buildings and if we are going to print them on a relatively small 3D printer’s build tray then the scale deduction is going to be large e.g. 1:200 So details like cills, door handles etc might simply be too small to print. The solution is to either print the building on a better scale e.g. 1:50 and print your building in segments and glue fit together which is time consuming or use a larger 3D printer which is more costly. 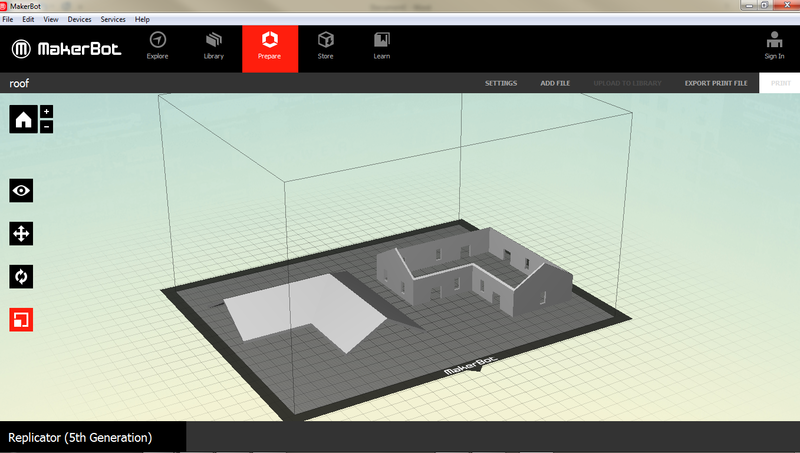 To illustrate the process we are just going to print a couple of walls and a roof on a Makerbot printer. 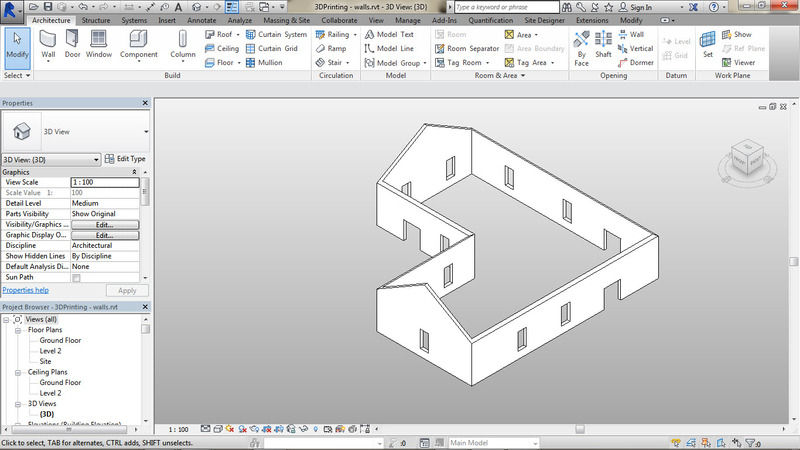 Firstly you’ll need to draw the building in Revit. I created walls, doors, windows and a roof. I isolated the walls and saved the drawing calling it Walls.rvt. Then I isolated the roof and moved it to ground level. I saved it to Roof.rvt. Each of these files then exported to STL format from within Revit. The STL exporter add in to Revit you can download from Autodesk Exchange (I call it the Revit Apps Store) or click here. The STL exporter can be found under the Revit Add-Ins tab. Then you open the Makerbot Desktop software and import the STL files. For this example I imported both and arranged them on the tray to be printer together. 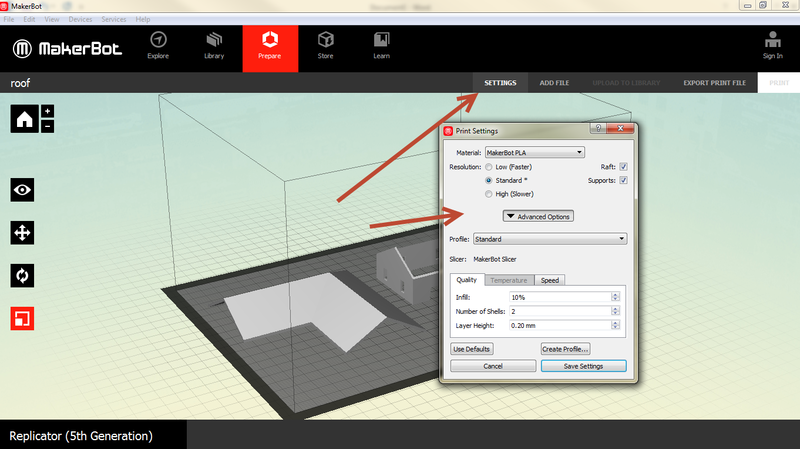 Optionally you can also use Autodesk MeshMixer to edit the STL files and before opening it with the Makerbot software. Once on the build tray a good idea is to have a look at the Settings. Yes there are lots of settings you need to be aware of and perhaps tweak like Infill percentage, size/quality of filament, speed etc. but for now we are leaving these out. You then simple click the Export Print File and the printer will start printing. This print took 3-4hours to complete.